What could be more romantic than Italy, and this restaurant serves up a little slice of Italy right here in the heart of downtown Castle Rock Colorado. My husband and I noticed this garden patio area with the fountain and soft lights and I thought it very reminiscent of my visit to Italy, so he knew he just had to bring me back here to see if the food and service was as good as the ambiance we’d seen outside. 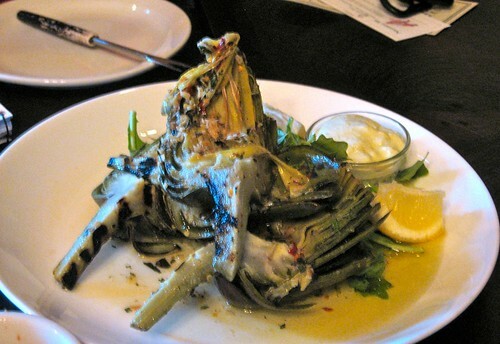 We started with The Grilled Artichoke which was sliced in half grilled and served with a lemon-garlic aioli. YUM! We also sampled the Tuna Carpaccio… thinly sliced ahi tuna, soy ginger vinaigrette, toasted sesame, avocado, and mango. This was just wonderful, fresh, with enticingly complex flavors. 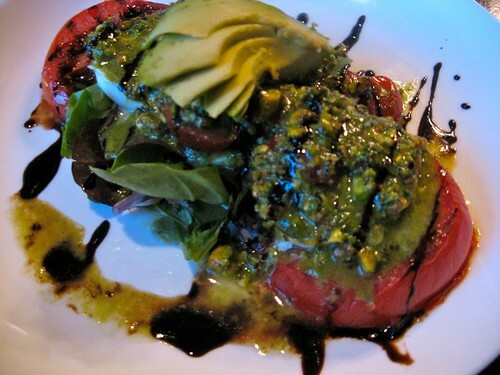 They have several salads available including a Grilled Summer Tomato & Fresh Mozzarella, Mixed Baby Greens, Italian and Traditional Caesar. We chose to share the Fig and Spinach Salad. This salad featured a pistachio crusted goat cheese served over prosciutto carpaccio and tossed with a light chianti-honey vinaigrette. Take a LOOK! One of my favorite Italian Foods is Pizza. I tend to like something other than pepperoni, so this pizza below attracted my attention. It has Roasted Chicken, Boursin cheese, artichoke hearts and of course brushed with extra virgin olive oil. 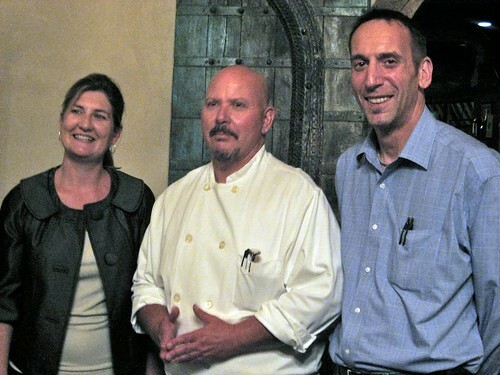 The Owner, Head Chef, and Marketing Director Maureen stopped by our table to check on us. Our waitress was just fantastic and knew so much about the menu and the chef’s new world take on old world Italian Classics. I am allergic to shrimp but she kept talking about this angel hair pasta in a puttanesca sauce… The chef was kind enough to make me a little taste of it being careful to not contaminate my dish with shrimp. You should always alert your server and the chef if you have any common food allergies but rarely will they go out of their way like this to give you a taste of something you expressed an interest in. These flavor combination’s in the puttanesca sauce did not disappoint. A blend of all the classic Italian aromatics.. garlic, basil, parsley, olives, tomatoes… Soooo flavorful it’s hard to explain, and the owner and the server had different takes on the classic story of what a “puttanesca” sauce is. I’ll let you read what the Wiki has to say about Puttanesca Sauce This picture does not do the dish justice at all. My husband is a more meat and potatoes guy so he ordered the Double Cut Pork Chop which is grilled and served in a ranch style Topping Italian Gigande Beans with roasted chilies and peppers and topped with pickled red onions and a chimichurri sauce. He enjoyed this huge hunk of pork immensely. The other options for dinner were a nontraditional take on Spaghetti, Baked Penne, Smoked Chicken Raviolis, Lasagna, Linguini with Clam Sauce, Eggplant Rollatini, Chicken Parmagiana, Pan Roasted Scallops, Grilled Florentine Steak, and Veal Piccata. They also serve burgers and sandwiches and have an entire lunch menu as well. Now for the most romantic and fun part of the meal… Dessert! OH MY GOSH! The pastry chef here is simply amazing. Take a look at these scrumptious things we had to choose from. Cannolis and Spumoni. 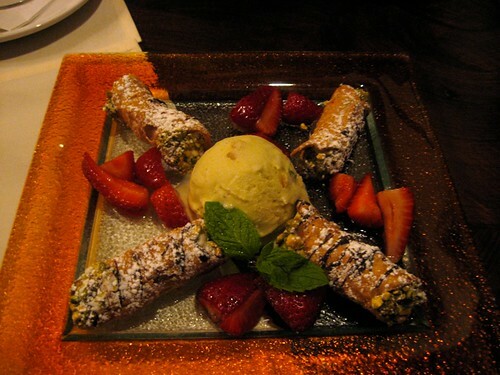 Classic mini cannolis served with a scoop of spumoni ice cream and strawberries pizza. My date (husband) chose this dessert.. for one thing, it’s the biggest and who can go wrong with chocolate, cream and berries… all high on the romance factor and tastes exploding in your mouth. Vanilla Creme Brulee with Caramelized Lemon Sugar – This didn’t look the prettiest but it was a perfect Brulee, crispy crunchy sugar topping with a killer creamy custard hiding underneath. Flourless Chocolate Cake – espresso flavored chocolate cake with warm chocolate sauce and roasted banana gelato. 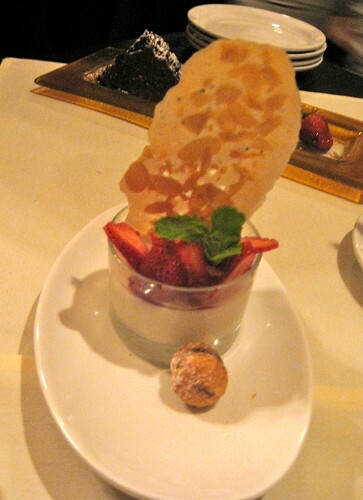 Coconut Panna Cotta with lime syrup, fruit garnish, and cookies. Chocolate Tiramisu – Rum and Kahlua soaked chocolate cake, iced in coffee ganache and layered with mascarpone sabayon. Sienna Restaurant, Castle Rock Colorado. We also enjoyed 3 glasses of wine each chosen by our server and they were reasonably priced and melded perfectly with our selections. This was simply a wonderful spot to choose for date night and one we will go back to again and again. Check it out and lets us know in the comments what you thought. Check out the website for the Courtyard at Castle Rock Here.